On Nov. 01-03, 2017, we held a Seminar at BI Norwegian Business School, Oslo (details here). Our main goals were (1) to present an overview of the current state of our work and get some feedback from the perspective of BI staff and students from different disciplines (Business, Law, Economics, Political Science), and (2) to personally and institutionally connect Legal Institutionalism to Wolfgang Stützel’s work. To that end, we had invited Geoff Hodgson (University of Hertfordshire), founder of Legal Institutionalism and editor of the Journal of Institutional Economics, Johannes Schmidt (Hochschule für Technik und Wirtschaft Karlsruhe), one of the few experts on Wolfgang Stützel’s work, and Charlotte Bruun (Aalborg University), who was the first to publish on Stützel in english with her excellent 1995 dissertation, “Logical Structures and Algorithmic Behavior in a Credit Economy“, to attend and contribute presentations. 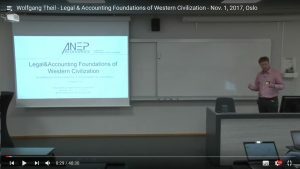 Wolfgang Theil’s presentation “Legal and Accounting Foundations of Western Civilization” (above) explicitly lays out the basic, historically specific legal institutional foundations of double entry bookkeeping in roman law, making explicit the two basic inherent dialectic conflicts of western civilization: that between the state (public law) and the market (private law), and that between state-mediated, impersonal legal relations (state legislation and private contracts) and traditional personal, kinship-based relations of informal reciprocity. The first conflict historically led to anacyclosis, a swing back and forth between more centralized and more decentralized forms of government which was well known to republican thinkers from Aristoteles over Polybios and Cicero to Machiavelli, Vico and Kant. Just like in the 1930s, after a phase of liberalism and democracy followed by a major crisis we are now witnessing a renaissance of more centralized forms of governing, often termed the “democratic recession“. From a long term historical perspective, this does not come as a surprise but fits in with a bigger pattern within western civilization that has been recurring ever since classical greco-roman antiquity. The second conflict, that between state-mediated and and kinship based relations, creates the whole phenomenon of “corruption” (including nepotism, now to be found in the White House as well). Both conflicts are historical constants, as Francis Fukuyama has brilliantly shown in his two recent books on the comparative history of the state, “Origins of Political Order” (2011) and “Political Order and Political Decay” (2014 – see his own overview here). They represent challenges for development and transition economics, but remain present in so-called “developed” economies as well. Nicolas Hofer’s presentation “Accounting, Money & Banking in terms of Law” picks up on that and presents some crucial distinctions in business accounting in terms of law – actual business practice serves as the microfoundation of our macro model. After clearly distinguishing 1st order objects of law (things) from 2nd order objects of law (rights vis a vis other legal persons who hold corresponding obligations), he distinguishes flows of monetary wealth affecting (1) the stock of means of payment, (2) net financial assets, and (3) net worth (equity), making clear that on the level of net financial assets, capitalism is a zero sum game – but not on the level of net worth (profit & loss statement), where “everyone wins” (achieves a profit within a period) is possible just as much as “everyone loses” (suffers a loss within a period). Special emphasis is given to the category of net financial assets and flows of monetary wealth on that level, which forms the key of Stützel’s theory of business cycles that we adopt. It allows for a precise distinction between “real” and “purely financial” transactions and to conceptualize balances of trade and on current account. Morris Copeland’s flow of funds accounts do not include that balance – or any balances, for that matter – therefore it is no wonder sources and uses do not add up to the same number as they should (Perry Mehrling vaguely notices some symptoms of this, but does not fix it – click on the link and watch 4:45 to 10:00). Nicolas takes this more precise accounting system up to our legally grounded version of the sectoral balances approach (routinely used in national accounting), which connects micro to macro accounting and then serves as a foundation for an ex ante macro model of business cycles within a circular flow model of a closed economy. Thomas’ Weiss builds on that and takes this further into macroeconomics, presenting an overview over Wolfgang Stützel’s Theory of Business Cycles. Stützel used the sectoral balances approach to build a coherent theory of business cycles that renders superfluous the controversy between Keynesians and Anti-Keynesians, which was epitomized in 2015/16 by the clash between Yanis Varoufakis and Wolfgang Schäuble. It is still present today between an apparent new quasi-Keynesian consensus forming internationally, vs. the old german austerity & export surplus strategy, now put into practice by new finance minister Olaf Scholz (SPD) who retained most of Schäuble’s personnel in the ministry of finance. Key to Stützel’s integration is the precise, theoretically coherent demonstration of what has been guessed in practice all along: that the holy grail of Keynesianism – demand-led output and employment – does apply, but not generally, not to every situation: it applies only to the special case of buyer’s market situations. In extreme buyer’s market situations, the paradox of thrift holds true, and anti-cyclical government surplus expenditures are necessary. But constant demand stimulus policies gradually dismantle buyer’s markets and then, if continued, transform them into stagflatory seller’s market situations. And in that situation, the mirror phenomenon of the paradox of thrift – what we call the paradox of surplus expenditure – applies. On seller’s markets, employment and output stimulus can only be brought about by government austerity, which gradually will dismantle seller’s markets and build buyer’s markets again, completing the cycle. Thus, Stützel’s theory is genuinely one of business cycles. It coherently demonstrates why neither permanent demand stimulus nor permanent austerity is needed, but rather more generally: anti-cyclical policy. In the words of Keynes: “The most important Agenda of the State relates not to those activities which private individuals are already fulfilling, but to those functions which fall outside the sphere of the individual, to those decisions which are made by no one if the State does not make them. The important thing for Government is not to do things which individuals are doing already, and to do them a little better or a little worse; but to do those things which at present are not done at all.” (J.M. Keynes. 1926. The End of Laissez-Faire. In: Keynes, J.M. 1931. Essays in Persuasion. London: Macmillan 1931). For present Germany, whose private household sector and corporate sector have consistently been net savers in terms of net financial assets over the past years, that would mean to end pro-cyclical government budget consolidation, and instead to increase government expenditure for useful investment into infrastructure and education, thereby easing the pressure on the foreign sector to take all the additional net debt corresponding to the continous german domestic surpluses. From our perspective, Germany within Europe should not press so much for austerity as it should press for building comparably reliable, relatively incorrupt state & legal institutions across the Eurozone and EU. Johannes Schmidt’s presentation “Stützel’s Theory of Business Cycles and Current Macroeconomics” builds on that and shows how Stützel’s theory of business cycles can function as a General Theory, capable of integrating current theories of business cycles and financial crises as describing special cases: New Classical Macroeconomics and Real Business Cycle, Post Keynesian (including Minskyan) and New Keynesian Models are covered, and “Full Money” proposals are also included. He accomplishes this by introducing a concept unique to Stützel’s approach to accounting based macroeconomics, the concept of lockstep behavior of partial groups. It can apply on the levels of (1) net financial assets and/or (2) means of payment. Lockstep behavior means that for all individual legal persons within a closed economy, inflows and outflows of (1) net financial assets (nfa) or (2) means of payment (mop) equal one another so that stocks of nfa and mop remain unchanged. For example, lockstep behavior of all nations with regard to net financial assets would mean that all nations maintain balanced trade vis a vis the rest of the world, i.e. their total sales of goods and services to the foreign sector would equal their total purchases of goods and services from the foreign sector (in terms of monetary value), leaving each nation’s net financial position – its net international investment position – unchanged (Keynes’ 1940’s Clearing Union idea was actually designed to work towards that goal). On the contrary, if inflows of nfa and/or mop deviate from respective outflows, there will be a change in the stock of nfa and/or mop. On that basis, Schmidt shows that “money does not matter” in new classical models because they implicitly assume lockstep behavior on both the levels of flows of net financial assets and flows of means of payment (lockstep mop: yes, nfa: yes): a special case that is indeed possible but very unlikely to be the normal case. But because of this implicit assumption, situations based on the other three cases: lockstep (mop: yes, nfa: no); (mop: no, nfa: yes); (mop: no, nfa: no) cannot be modeled. Naive quantity theory can be shown to presuppose lockstep on the level of net financial assets, but not on the level of means of payment (lockstep mop: no, nfa: yes) – another special case that has some historical applications but today is an unlikely case. While the monetarist version of the quantity theory has mostly been abandoned, naive quantity theory has reappeared after 2008 as a renaissance of “full money” proposals (inspired by Irving Fisher’s 100% money) which in some ways could be called “supermonetarist” (Heiner Flassbeck). Stay tuned to find out how New Keynesian Macroeconomics and Post Keynesian/Minskyan Models fit in this integrative schema – Schmidt’s presentation will be online soon. This underlines that Stützel’s work, other than heterodox approaches viewing themselves as an alternative to the neoclassical model, is capable of functioning as a General Theory (like Keynes had intended), integrating both neoclassical and heterodox models as special cases within a coherent general framework. In fact, it was one of Stützel’s explicit goals to render superfluous the controversy between Keynesians and Anti-Keynesians by demonstrating the specific conditions under which each position applies, thus correcting their overgeneralizations. Geoff Hodgson’s presentation “Legal Institutionalism: Capitalism and the Constitutive Role of Law” presents an overview of Legal Institutionalism, delineating how it crucially differs from New Institutional Economics which still underconceptualizes law and the constitutive role of the state for legal relations. He clearly demonstrates this using the examples of property rights & contract and the firm (corporation) as a juridical person – a fictitious legal entity defined by the legal capability to enter contracts, to sue and being sued, and obliged to pay taxes, and makes a strong case for a legal institutionalist definition of capitalism. Stay tuned, we will publish all these over the next few weeks – and we are looking forward to your comments, criticisms, questions and suggestions – you can post them below. Thanks!